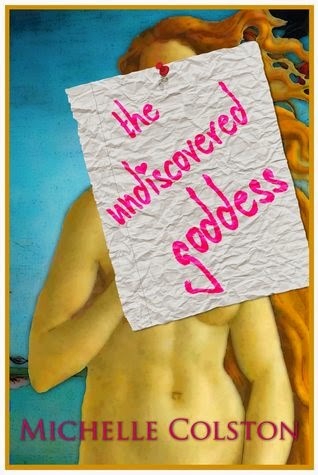 The Undiscovered Goddess by Michelle Colston is available at Abebooks, Amazon, and Barnes and Noble. Who knew a Cosmo quiz and a bottle of wine could change a woman’s life? Holly, housewife and frazzled mother of three, is determined to discredit the lackluster result of a Cosmopolitan magazine quiz. After buying a workbook geared toward helping her find her inner goddess, Holly sets off on a year of self-discovery, journaling through each exercise as she goes. Facing inner demons, yoga, an explosive colon cleanse and REALLY spicy curry, the lessons are hard on her emotions, not to mention her digestive system. But does she succeed in the end? Beyond the superficial, what important lesson does Holly’s inner goddess have the power to teach her…and what can Holly teach you? I opened this book and thought, Oh gawdess, the blurb lied to me! This is a self-help book in disguise. Turns out, it's not a self-help book after all, just like the blurb promises. After a quiz in a glossy rag calls Holly shallow, she buys a workbook journal, the book within the book called Discover Your Inner Goddess, and actually does the prescribed exercises. I hated Holly at the beginning of the story. She's neurotic and sardonic bordering on phlegmatic about a relatively easy (normal) life that would delight many people. As Holly works through the workbook, her confidence grows. Her sarcasm becomes humorous. Her story is motivational in a way that most self-help books never are - we, the readers, watch the changes that could happen, if only we make up our minds to pursue them. Hand to Divinity, at one point, I scared my dog out of sleep when I almost snorted water from my nose laughing at Holly's experience with a cleansing diet (bathroom humor for girls)! Somewhere in the middle of the story (probably during the self-cleansing diet), I fell in love with Holly. She's someone that could be a friend (if only she was real). I snagged a free copy of this book from NetGalley in exchange for review. The NetGalley free-edition has many typographical formatting errors that I hope are fixed in other (paid-for) digital editions.